Angénieux is a French optical company founded in 1936 and installed at Saint-Héand. 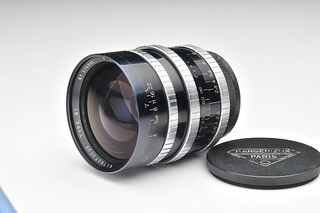 It has made lenses for still and movie cameras, and for military applications. 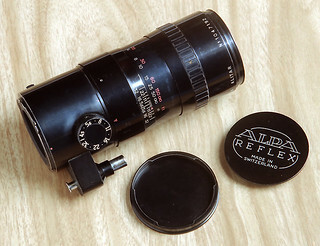 Early Alpa Reflex cameras came with 50mm f/2.9 Angénieux lenses. In 1950, Angénieux released the first retrofocus lens, a design that allows to fit a wide-angle lens on an SLR without interfering with the moving mirror. In 1958, it launched its first zoom lens for movie cameras. The idea of a zoom lens appeared early, and the first useable models for movie films appeared in the 1930s, but remained highly experimental. Angénieux is one of the first companies to have sold zoom lenses on a large scale, after the Voigtländer Zoomar and SOM-Berthiot. Angénieux built the first zoom lens for a Leica still camera, with the 45-90/2.8 zoom for the Leicaflex. Angénieux stopped the production of SLR camera lenses in 1994, due to "difficulties in making lenses which are fully compatible with today's modern SLRs". It continues to produce lenses for the movie and video industry, as well as other specialised applications. The fast Angénieux 1:0,95/50 mm C-mount movie camera lens has recently had a small revival in popularity, thru the adaptibility of cine lenses onto new digital camera systems such as Micro Four Thirds and Sony NEX. This page was last edited on 9 April 2018, at 13:06.